Lovely tree. My wants list is getting longer. I like the way you've done the bricks and gravel under the tree. It really sets it off. Thanks Blodyn , it makes it easier to mow the grass and stops a lot off the weeds from growing up into the shrubs , only problem is I have the ideas , and my poor husband usually has to do the hard work . Thanks for your comment onthe rose pic! And it has such a devine scent too. Sort of intoxicating. My grandfather was into roses and as a boy I used to spend ages just smelling them! What kind of small tree is in your garden, its lovely. This looks lovely! How tall will it grow? Wow...! what a lovely dogwood specimen. I agree with blodyn, the rocks and bricks look fantastic. Beautiful shrub! Would love one of these, it almost looks Japanese. Great photo! this tree doesn't grow much larger than this, does it? Hi Amy......I have just been looking at this lovely tree again, does it have berries now, I'm thinking of getting one as a Xmas Pres from Mum. Amy...I've been looking at your tree again........would it be best to plant in the Winter months though? Janey , if it,s in a pot it would be alright to plant it now but if you are getting a bare root one it would be best to wait until the autumn , I have tried to take cuttings off mine without any success so far , it,s not as easy as the ordinary dogwood ! It's spectacular....I love it.....will see if I can get one potted, then enjoy it all summer and plant it Autumn....I have just the right spot now, where I have a young Laburnam....the peach/purple one....which I'm not keen on. Yes, it's perfect. If it has berries, it is in a good spot. Mine is planted just in a walkway and the berries are very squishy. And then they come into the house.... planted before we bought the house. 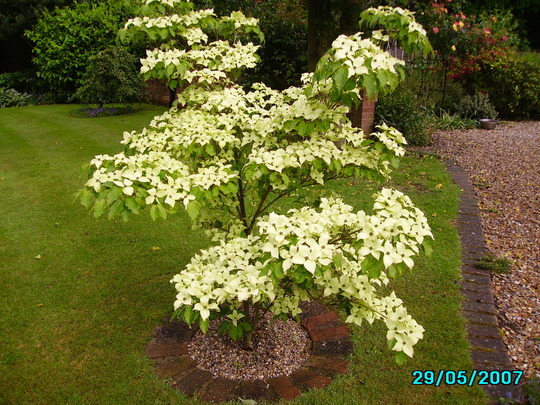 This photo is of species Cornus Corsa. See who else has plants in genus Cornus.